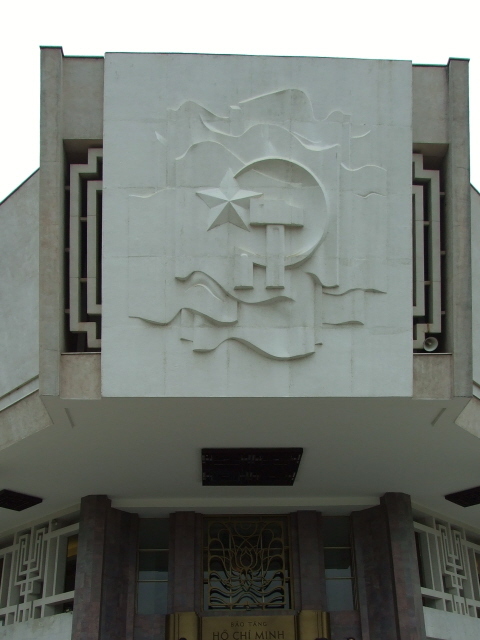 A museum in Hanoi, Vietnam, about the country's deceased great communist leader. 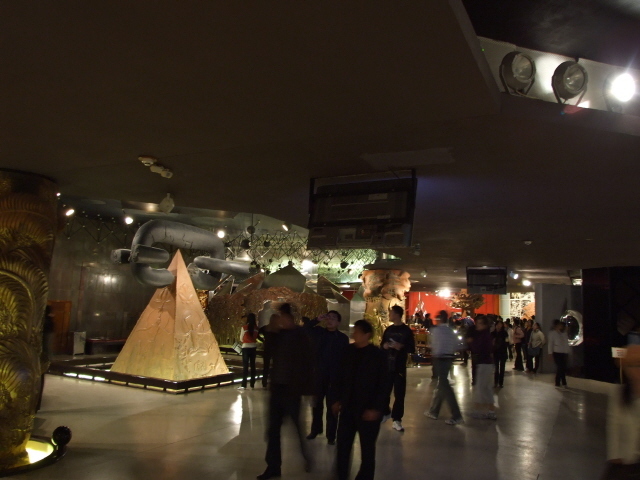 The museum opened as late as 1990 – exactly a century after Ho Chi Minh's birth. It's located near the Ho Chi Minh Mausoleum and, like this, is a must-see, not so much because it is so good but because it is in many places so bizarre. What there is to see: The building as such is already impressive in its very own way. 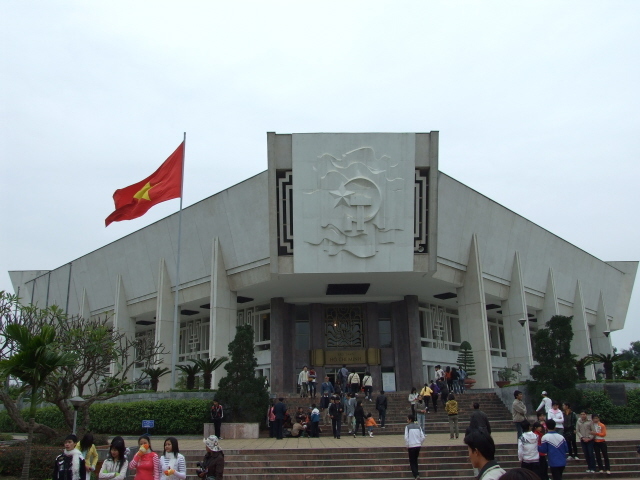 It's a futuristic looking pile with a gigantic white socialist symbol over the entrance, showing the Vietnamese star and the communist party hammer and sickle in front of (faceless) flags. 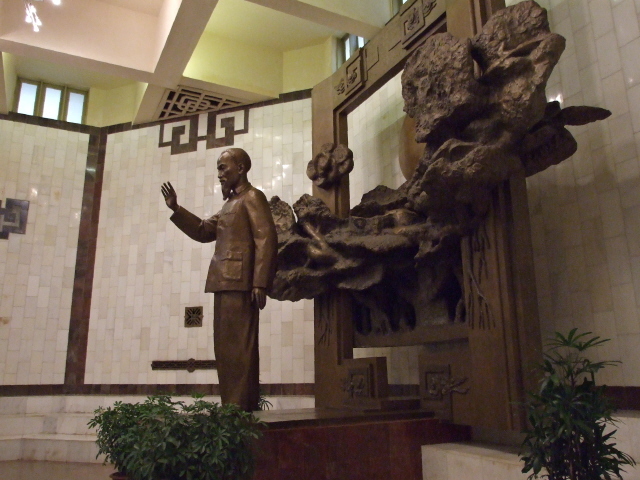 In the lobby hall you're greeted by a big bronze statue of Ho Chi Minh, his hand held up as if to say "Hi! ", in front of a strange chunky mass of more bronze of unidentifiable meaning. Then it's upstairs to the exhibition rooms proper. The contents are a mix of the totally predictable and the totally, bafflingly bizarre. You'd expect to see old photos, documents and personal belongings of the great man, and you'd expect it all to be rather celebratory, and indeed those expectations are borne out. Photos cover his early days as well as his works abroad and at home. Objets on display include things like clothes, Ho's watch and his personal pistol. 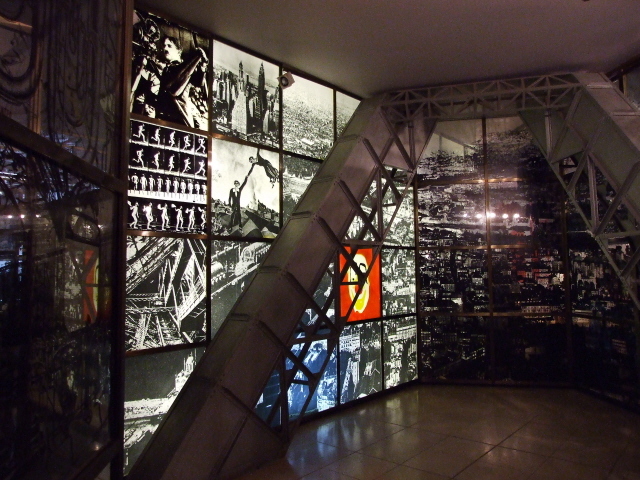 There are also screens showing some related footage, so it's also nice and multimedia modern. Some of the artefacts are also on the bizarre side. 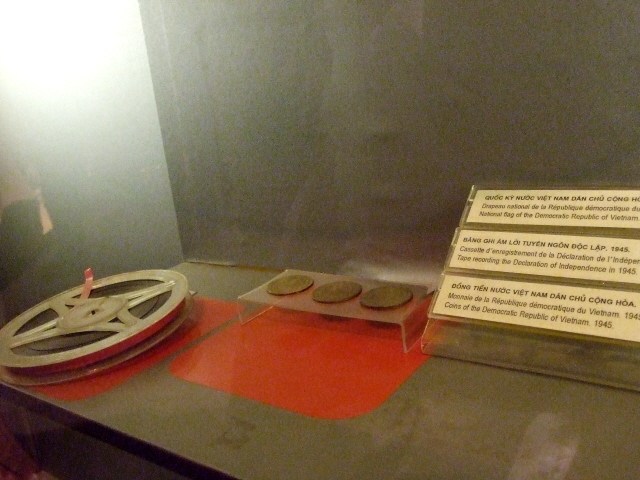 The display of the (quite ordinary) pens used in the signing of the Paris Peace Accords are more or less understandable, but then there's also the tape recording of the Declaration of Independence in 1945 – not being played, mind you, but just the actual audiotape reel simply lying there in a glass display case! I mean, since you can't see its content, it could be any old tape! You have to suppress a giggle at this point. Incidentally: a sign, in four languages, actually admonishes visitors to "please remain quiet". So don't get carried away! The text labels and panels are mostly multilingual too, in Vietnamese, French and English. Original text documents are typically untranslated, though (and some are in Russian, as well as Vietnamese). Overall, the impression you're left with is one of amazement and wonder. You won't learn all that much in the sense of gaining information, but the visual impressions are surely lasting. One of the most lasting ones in my memory is that of two Vietnamese girls taking turns posing for snapshots by a (slightly smaller than) life-size photo of Ho – pretending to hold his hand! And it didn't look like they were doing it as a joke, rather as a sign of genuine reverence. Location: on Ngoc Ha Street, about a mile (1.5 km) west of Hanoi's Old Quarter, and just a few steps south-west of the Ho Chi Minh Mausoleum near the botanical gardens. Details: easily walkable from the Ho Chi Minh Mausoleum, and theoretically also from the Old Quarter, only a mile or so away, but with the (inaccessible) Citadel in the way, so you'd have to walk around it (the detour is shorter when passing the Citadel on its northern end, but the southern end is more interesting, esp. as you pass the Military History Museum). Alternatively get a cyclo. The museum has the usual Vietnamese opening times, i.e. 7:30 to 11:30 a.m. and 1:30 to 4:30 p.m.; admission may be variable, when I went it was 15,000 Dong, but others have quoted 10,000 … it's minimal in any case. 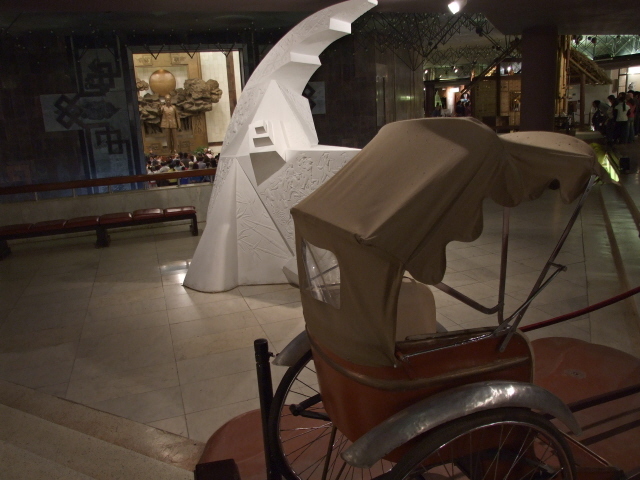 Nominally, photography was supposed to be prohibited in the museum, but when I went on New Year's Day 2009, everybody was allowed to take cameras in and use them (which most people happily did, myself included). I don't know whether that was just a one-off on the occasion of a special day, or whether the restriction has been lifted generally. Time required: allow at least an hour – if you want to study everything in detail, no matter how bizarre, then you could spend two hours or more in here. Combinations with other dark destinations: obviously, the Ho Chi Minh Mausoleum just round the corner also thematically makes for a perfect combination. Go there first (early in the morning) and do the museum afterwards. En route you can (and should!) take in Ho Chi Minh's stilt house (cf. Ho Chi Minh Mausoleum).